Learning how to putt may be the most important aspect to a well rounded golf game. There are multiple components to learning how to putt: form, pace, and the ability to properly read the break to name a few. There is an old saying in golf: "Drive for show, putt for dough!" This phrase should be chiseled into your head because it is the absolute truth! On the scorecard, a one inch putt counts exactly the same as a 300 yard drive down the middle of the fairway. Learning the basics of putting is extremely important and will certainly reap benefits on the course. You can read all the golf swing tips that you want, however, there is no substitute for some old fashioned practice! Because there are some many variables, spending quality time around the green practicing will come in handy. While there is no "correct" grip to use while putting, making sure that you are comfortable with the grip that you are using is extremely important. Putting is all about touch, so a lot of practice is necessary in order to make your grip and stroke second nature. There are some similarities between normal golf grips and those used with putting. Overlapping and interlocking grips are common, with some slight variations for personal touch. There also are golfers, such as Tiger Woods, who use a reverse interlocking grip where the left index finger interlocks as opposed to the right pinky finger. There also are some more unique grips such as the cross handed grip where your left hand is actually further down on the club (for right handed golfers. There also is a claw type grip, which many golfers find advantageous because it allows for a more pendulum like stroke with less wrist action. As I mentioned above, putting grips are very individualized and for whatever grip that you decide to use, make sure that you practice and feel comfortable with it because any lack of touch on the green could lead to additional strokes. Once you get to the green, one of the first things you need to do is familiarize yourself with the layout and the possible slope. Some greens will be very subtle, while others may have tiers or severe changes in elevation that will need to be considered prior to attempting the putt. To get a good look at the break, crouch down and cup your hands over your brow. Your hands will block out any distractions and will create a "tunnel vision" effect, allowing you to focus on the break with greater ease. It also is a good idea to analyze your shot and the green from multiple angles, typically from behind the ball and then again from behind the cup. You may miss something at first glance that maybe will be easier to see from a different position. To break in down to simple factors, the main components that you are looking for are vertical changes (up or down) and horizontal changes (left to right or vice versa). On a really challenging green, you may have to look at multiple changes in slope which will make your putt even more difficult to sink. One other tip regarding the break is that the further away from the hole you are, the more of an effect it will have on your putt. Many amateurs have a tendency to over compensate for the slope with short putts and end up taking higher scores than necessary. In my opinion, learning how to properly read the break and then apply that knowledge to your putting stroke is the most difficult aspect of learning how to putt. It takes lots of practice to excel at this skill, and even the pros do not have it mastered consistently! Once you have feel confident with your read of the break, you need to determine the amount of pace to put on the ball. The slope will play a huge roll in how much speed the golf ball will need. Obviously, putting up hill will require more speed and force than putting downhill. Another thing to consider is that as the ball slows down, the break will have more of an effect on the ball's path. Ideally, you want to put enough pace on the golf ball to hit it roughly a foot past the hole so that the ball has enough speed to avoid breaking too much at the very end. 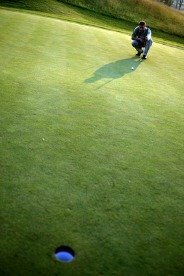 On a side slope, a key putting tip is to realize that the first part of the putt will be uphill while the last part will be downhill. You need enough pace to start of putt off on the right path but realize that it will begin to slow once it reaches the highest point before turning and heading downhill. It can be very difficult to learn exactly how much pace to put on the ball so that is why practicing putting on various slopes is important. It may be helpful to visualize the intended path of the ball in your head prior to putting. With a large break, try to pick a spot on the green where you would like the ball to begin its break and try to hit it to that spot. When you learn how to putt, a proper putting stroke will help you keep the ball on target. Feet should be roughly shoulder width apart, and the ball should be located towards the front of your stance. The knees should be slightly bend, yet relaxed. Your eyes should be positioned directly over the ball. One of the most important keys to learn while putting is to move the club primarily with your shoulders. If you are using too much wrist, you will lose touch and control over the ball. Swinging with your shoulder will lead to a more smooth, and effective putting stroke. As you make the back stroke, keep the putter blade square with your target. Swing through the ball, using only your arms, keeping the rest of your body very still. Hold your club still and the end of the stroke and hopefully your ball will be headed towards its target! When dealing with a short putt, the main factor that will come into play is the club face angle. If you are able to properly line up your shot, and maintain this angle throughout the swing, your chances of sinking that putt go up significantly. Many golfers struggle with short range putting from this sole factor! Other factors that you need to take into account when learning how to putt are moisture on the green, wind, and small moveable objects like leaves. Moisture on the green will slow down any putt faster than a dry green so you will certainly need to hit the ball a little harder in order to make up for the difference. Unless you are playing in extremely windy conditions, wind won't be too much of a factor but it is always good to keep in mind. Also, before you putt, scan the intended line and look for any leaves, twigs, seeds, etc. that may be in your way. All of these objects can be safely moved prior to putting. *There are some aspects of putting that are highly individualized such as putter length and style of reading a putt. The information on this page is only intended to provide the basics of how to putt. If you are looking to further work on your putting, please consider reading my Putting Drills page for specific exercises around the green to help cut strokes.